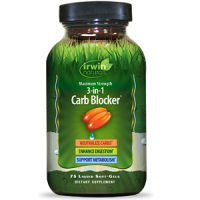 Irwin Naturals 3 in 1 Carb Blocker Review - Should You Buy It? Carb blockers are used to prevent the body from absorbing any carbs or starch that you ingest, helping you to lose weight. With companies jumping on the natural supplement train, it is very hard to tell which ones work. The reason for this review of Irwin Naturals 3 in 1 Carb Blocker is to provide you with all the necessary information you need before purchasing this product. 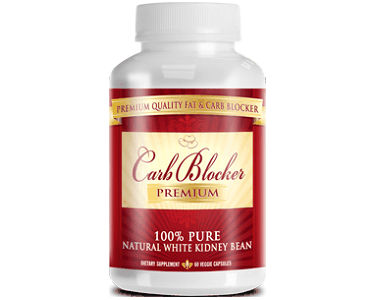 3 in 1 Carb Blocker claims to use a triple action approach designed for those who enjoy a carbohydrate-rich diet. The formula is said to help neutralize starch enzymes, enhance digestion and support a healthy metabolism to help you reach your ideal weight. 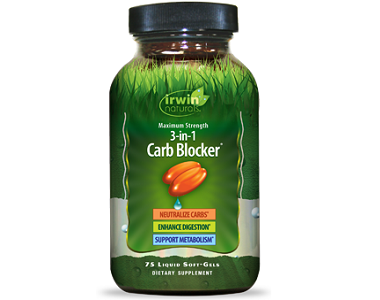 What’s in Irwin Naturals 3 in 1 Carb Blocker? Chromium – A metallic element that helps regulate blood sugar and helps to convert insulin into energy. Flaxseed Oil – increases metabolism and helps to burn fat, it is also high in omega fatty acids. Common Bean (White Kidney Bean) Extract – This ingredient inhibits the amylase enzyme from breaking down carbs, preventing the body from absorbing them. Cinnamon – Helps to lower your glucose response after eating a carbohydrate-rich meal. Lipase – An enzyme that aids in digestion and helps to break down fat. Protease – An enzyme that breaks down fats and proteins making it easier for the body to absorb. BioPerine Black Pepper Extract – enhances absorption of the active ingredients in supplements. Ginger Extract – Ginger is known to reduce nausea and digestive issues and helps with pain and inflammation. Unfortunately, this formula also contains binders and fillers which do not offer any nutritional value and may compromise the quality and potency of the kidney bean extract. This product also has a Prop 65 warning which means that it contains more than 0.5 micrograms of lead per daily recommended dose and is known to the State of California to cause birth defects or other reproductive harm. How Do You Use Irwin Naturals 3 in 1 Carb Blocker? The suggested serving size is 2 capsules which should be taken twice a day before eating meals or snacks that contain starch. Research shows that ingesting 125 mcg of Chromium may not be substantial enough to produce optimum results for weight loss and energy. It is recommended that this formula is used with a reduced calorie diet and exercise plan. Each bottle of 3 in 1 Carb Blocker costs $22.99 inclusive of shipping for 75 soft gel capsules. Irwin Naturals offered a $5.00 discount coupon for this product at the time of this review. Unfortunately, we did not find any bulk purchase discounts available for this product online. Unfortunately, We did not find any policy which mentions a satisfaction guarantee. We are always skeptical about brands that don’t offer any risk-free guarantee on their formula and we feel that the lack of guarantee does not provide us with any confidence in the effectiveness of the product. After inspecting and analyzing all the facts, we found a few things we like about this product. We admire the fact that Irwin Naturals donates funds to environmental charities that look after our planet and the health of our children, we also like that their prices are affordable and include shipping and handling fees. There are also a few downsides to this product as well, we were disappointed to find that the formula contained additional fillers and binders and we are concerned about the Prop 65 warning. Another drawback is the negative feedback from consumers about the side effects and condition they received their product in and since there is no refund policy available for this product, we cannot confirm if these unsatisfied consumers were able to get their money back for the damaged goods or for their disappointment in the effectiveness of the product.